The Grand Ducal Crown of Tuscany (Italian: corona del Granducato di Toscana) was a ducal crown created by the Medicean Grand Dukes of Tuscany. The old grand ducal crown in an engraving. Cosimo I de' Medici, duke of Florence, sought to achieve a title which removed him from his status as a feudatory of the Holy Roman Emperor and gave him more political independence. Getting nothing from the Emperor, he turned to the Papacy. Already he had attempted to get Paul IV to give him the title of king or archduke with no success. Finally in 1569, after many favours and dealings of differing levels of legitimacy, Pope Pius V released a Papal bull which conferred the style of Altezza Serenissima and the title of Grand Duke, a very rare title ranked him above a Duke, but below a Prince. In January 1570 Cosimo I was crowned by Pius himself at Rome, though by rights such a move was the prerogative of the Emperor. For this reason, Spain and Austria refused to recognise the new title, though France and England immediately recognised its validity. With time all Europe came around. The crown of the Grand Duke of Tuscany was clearly distinct from both princely and ducal crowns. It was a gold circlet decorated with emeralds, rubies and pearls with rays projecting from the top. Uniquely the crown had a large fleur de lis at the front in the centre. Gian Gastone with the new grand ducal crown, modified from the previous. When Cosimo III, Grand Duke of Tuscany (1670-1723) received the "right to royal rank" from Vienna added arches and a globe to the top of the grand ducal crown, as these were the typical elements of a royal crown. The new status of the Grand Duchy included among other things a change of style from Altezza Serenissima to Altezza Reale. The Grand Ducal Crown is only known from drawings and paintings, since it was lost during the Napoleonic Occupation. A copy of the crown was placed in the coffin of each of the Grand Dukes at their funerals. One of these, which belonged to Gian Gastone de' Medici (r. 1723-1737) was recovered during a survey of the corpse and is now conserved in Florence. The House of Medici was an Italian banking family and political dynasty that first began to gather prominence under Cosimo de' Medici in the Republic of Florence during the first half of the 15th century. The family originated in the Mugello region of Tuscany, and prospered gradually until it was able to fund the Medici Bank. This bank was the largest in Europe during the 15th century, and it facilitated the Medicis' rise to political power in Florence, although they officially remained citizens rather than monarchs until the 16th century. 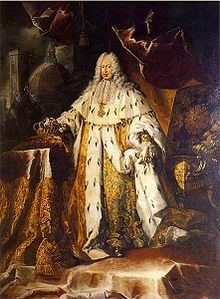 Francis I was Holy Roman Emperor and Grand Duke of Tuscany, though his wife Maria Theresa effectively executed the real powers of those positions. They were the founders of the Habsburg-Lorraine dynasty. From 1728 until 1737 he was Duke of Lorraine. 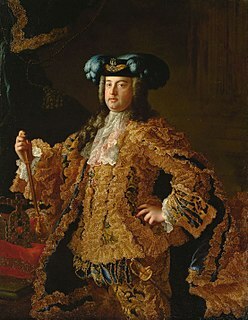 Francis traded the duchy to the ex-Polish king Stanisław Leszczyński in exchange for the Grand Duchy of Tuscany as one of the terms ending the War of the Polish Succession in November 1738. The duchy and the ducal title to Lorraine and Bar passed to King Louis XV of France upon Leszczynski's death in 1766, though Francis and his successors retained the right to style themselves as dukes of Lorraine and Bar. Cosimo I de' Medici was the second Duke of Florence from 1537 until 1569, when he became the first Grand Duke of Tuscany, a title he held until his death. Anna Maria Luisa de' Medici was the last lineal descent of the main branch of the House of Medici. A patron of the arts, she bequeathed the Medici's large art collection, including the contents of the Uffizi, Palazzo Pitti and the Medicean villas, which she inherited upon her brother Gian Gastone's death in 1737, and her Palatine treasures to the Tuscan state, on the condition that no part of it could be removed from "the Capital of the grand ducal State....[and from] the succession of His Serene Grand Duke." Gian Gastone de' Medici was the seventh and last Medicean Grand Duke of Tuscany. The Grand Duchy of Tuscany was a central Italian monarchy that existed, with interruptions, from 1569 to 1859, replacing the Duchy of Florence. The grand duchy's capital was Florence. Tuscany was nominally a state of the Holy Roman Empire until the Treaty of Campo Formio in 1797. Cosimo III de' Medici was the penultimate (sixth) Medici Grand Duke of Tuscany. 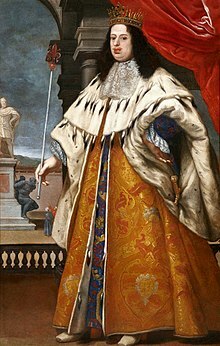 He reigned from 1670 to 1723, and was the elder son of Grand Duke Ferdinando II. Cosimo's 53-year-long reign, the longest in Tuscan history, was marked by a series of ultra-reactionary laws which regulated prostitution and banned May celebrations. His reign also witnessed Tuscany's deterioration to previously unknown economic lows. He was succeeded by his elder surviving son, Gian Gastone, when he died, in 1723. Il Duca di Firenze, rendered in English as The Duke of Florence, was a title created in 1532 by Pope Clement VII. There were effectively only two dukes, Alessandro de' Medici and Cosimo de' Medici, the second duke being elevated to The Grand Duke of Tuscany, causing the Florentine title to become subordinate to the greater Tuscan title. Eleanor of Toledo (Italian: Eleonora di Toledo, born Doña Leonor Álvarez de Toledo y Osorio, was a Spanish noblewoman who was the wife of Cosimo I de' Medici and the Duchess of Florence. Although Eleanor is often referred to as the Grand Duchess of Tuscany, she predeceased the creation of the Grand Duchy of Tuscany. She is credited with being the first modern first lady, or consort. She served as regent of Florence during the absence of her spouse. 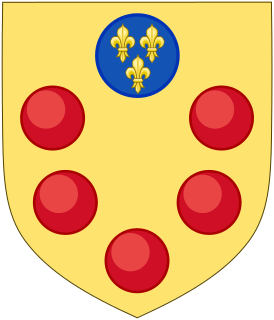 The Duchy of Florence was an Italian principality that was centred on the city of Florence, in Tuscany, Italy. The duchy was founded after Emperor Charles V restored Medici rule to Florence in 1530. Pope Clement VII, himself a Medici, appointed his relative Alessandro de' Medici as Duke of the Florentine Republic, thereby transforming the Republic of Florence into a hereditary monarchy. Vittoria della Rovere was Grand Duchess of Tuscany as the wife of Grand Duke Ferdinando II. She had four children with her husband, two of whom would survive infancy: the future Cosimo III, Tuscany's longest-reigning monarch, and Francesco Maria, a prince of the Church. At the death of her grandfather Francesco Maria della Rovere, she inherited the duchy of Urbino which reverted to her second son, Francesco Maria, at her death. She was later entrusted with the care of her three grandchildren. Her marriage brought a wealth of treasures to the House of Medici, which can today be seen in the Palazzo Pitti and the Uffizi Gallery in Florence. The Order of Saint Stephen is a Roman Catholic Tuscan dynastic military order founded in 1561. The order was created by Cosimo I de' Medici, first Grand Duke of Tuscany. The last member of the Medici dynasty to be a leader of the order was Gian Gastone de Medici in 1737. The order was permanently abolished in 1859 by the annexation of Tuscany to the Kingdom of Sardinia. The former Kingdom of Italy and the current Italian Republic also did not recognize the order as a legal entity but tolerates it as a private body. Marguerite Louise d'Orléans, a Princess of France who became Grand Duchess of Tuscany, as the wife of Grand Duke Cosimo III de' Medici. Violante Beatrice of Bavaria was Grand Princess of Tuscany as the wife of Grand Prince Ferdinando of Tuscany and Governor of Siena from 1717 until her death. Born a Duchess of Bavaria, the youngest child of Elector Ferdinand Maria, she married the heir to the Tuscan throne, Ferdinando de' Medici, in 1689. Violante Beatrice loved him but Ferdinando did not return her affection, declaring her too ugly and too dull. Her brother-in-law, Prince Gian Gastone, befriended her out of sympathy, a friendship that lasted until Violante Beatrice's demise. 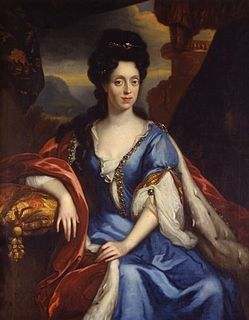 Anna Maria Franziska of Saxe-Lauenburg was the legal Duchess of Saxe-Lauenburg in the eyes of the Holy Roman Emperor, the overlord of Saxe-Lauenburg, from 1689 until 1728; however, because her distant cousin George William, Duke of Brunswick-Lüneburg, conquered the duchy by force in 1689, she exercised no control over the territory, instead living in her manors in Bohemia. Ploskovice is a village and municipality (obec) in Litoměřice District in the Ústí nad Labem Region of the Czech Republic. The Princes of Ottajano are a cadet branch of the ducal dynasty of Tuscany. Along with the Veronese Medici Counts of Caprara, and Gavardo, they make up the last and closest descendants to the main line of the House of Medici.